This is the bag I use every Monday, since more than ten years, when going to our quilting meetings. When a friend of the quilting group brought one day such a bag, we all fell in love with it and decided that we must absolutely have one similar. The same day I did the pattern and next day I started cutting and sewing with the greatest enthusiasm! One week later, when I brought my bag, all the members of the group ordered one, and then a second one! 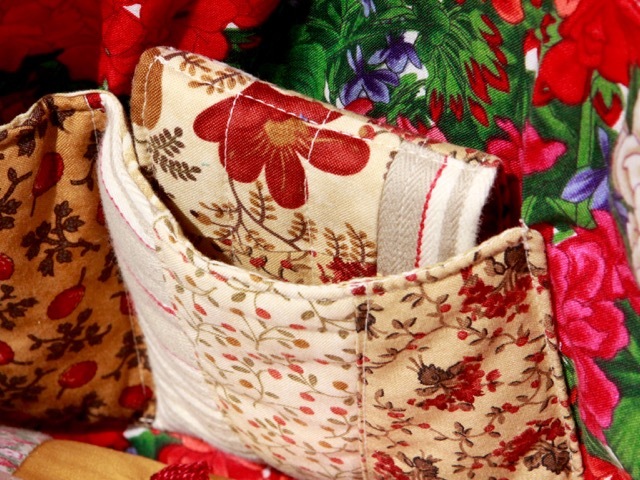 As I love using scraps and mixing all sorts of fabrics, I really enjoyed creating each time a new bag. You can see on the pictures two inside pockets and a matching needle book. In the bag is my Log Cabin quilt. Wow it looks new, it's held up well! Such fun patchwork and fabrics I would never have guessed you didn't make it yesterday. I can see why all your friends wanted one. Thanks for sharing your gorgeous photos. I too can see why everyone liked and wanted one. Love the little matching needle case too. Thanks for rejuvinating this under our totes theme this week! Good to see this one again! This is absolutely the cutest bag and it would be fun to have several!!!! Oui, vraiment ce sac a connu un franc succes et a fait l'unanimite...qui ne l'a pas !!! et grace a toi...Merci Christine ! What a lovely bag quilting stuff bag. It's gorgeous and looks very useful too! 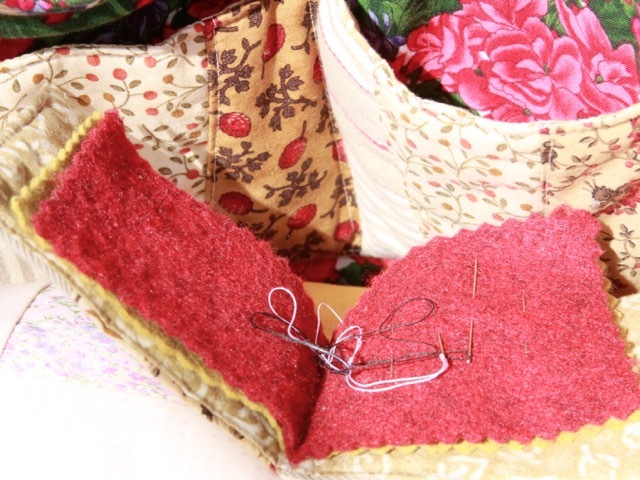 I love the use of scraps too, what a wonderful treat to see some old favourites again! 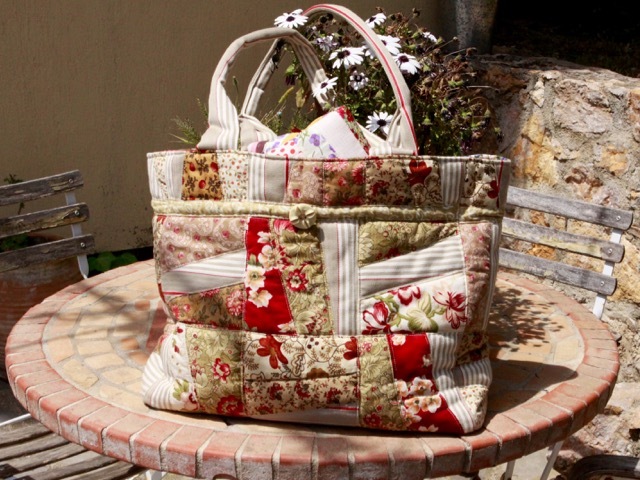 It is the perfect bag for your quilting meetings, big enough to hold a quilt and full of your patchwork style. It's no surprise that everyone wanted one! Il est superbe et pratique...et inusable on dirait! Et la etite pochette coordonnée, ça c'est le must! Le quilting de tous les morceaux lui donne un beau relief. Bravo et ça ne m'étonne pas que les commandes aient suivi! What a marvellous bag - ideal for carrying your quilting needs around. A collection in various fabrics would be ideal!! On a toutes besoin d'un sac pour nos encours et le tien est très joli et si bien réussi ! How fun that your bag became such a hit Christine! It deserves it too! I love all the warm colors and the floral scrappiness. Those geraniums peeking out from inside are just the sweetest touch. Christine that is a nice bag and so useful too. 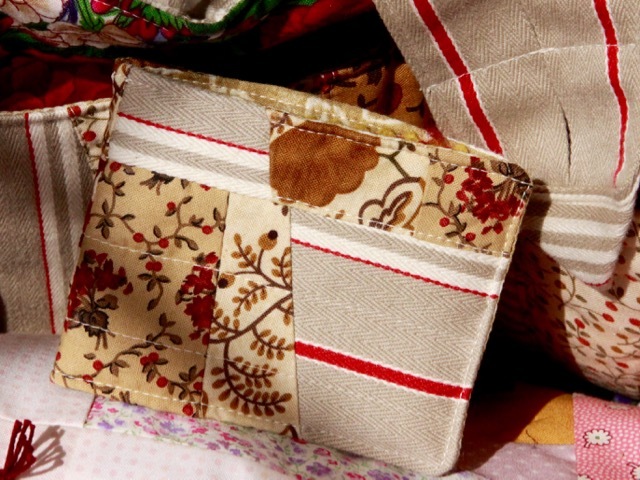 I love scrappy bags and quilts. Thanks for your sweet comment about my Bella bag too. If I ever see a quilter on a way to a meeting with a really fabulous bag, I'll know its you. I really love your bag, just my style. I enjoy seeing people that have made their own things. Like at quilt shows not too many people carry a bag they have made themselves. I take mine to the sewing seminars and expos! Love it. I see why everyone wanted one of these bags!! It is fabulous! You are so talented! I love that lining fabric. Love the pockets and general usefulness of this bag - it looks great! I wish my crazy quilted bag was anything like yours! Pretty and useful, what more can you ask for? 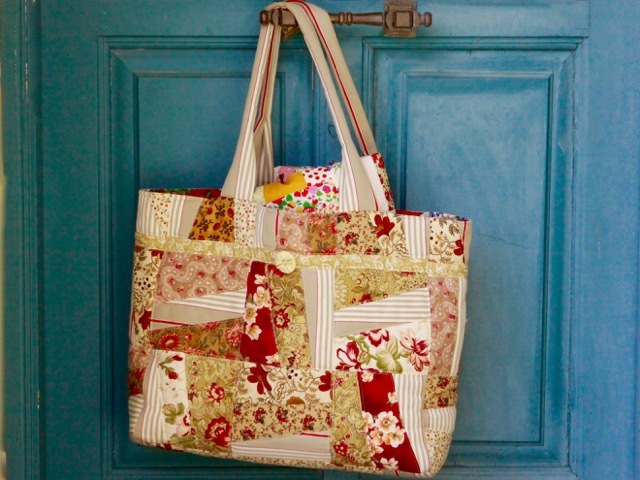 What a great bag - I've never tried crazy quilting! 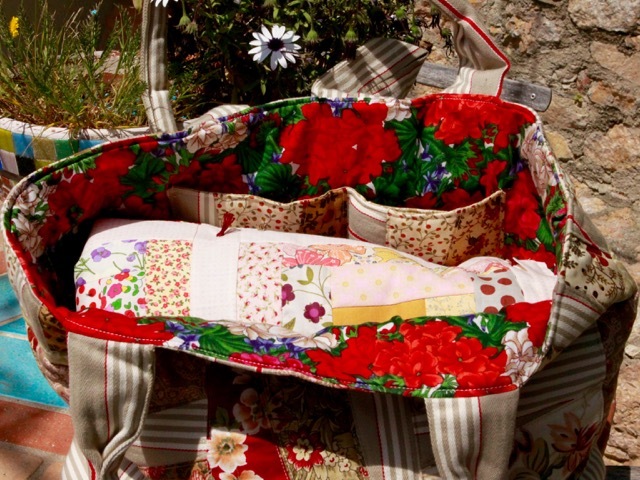 There's no such thing as having too many gorgeous quilt bags, this one is a real beauty I think I'm going to have to make myself another one, you've put me in the mood! This is a great bag! 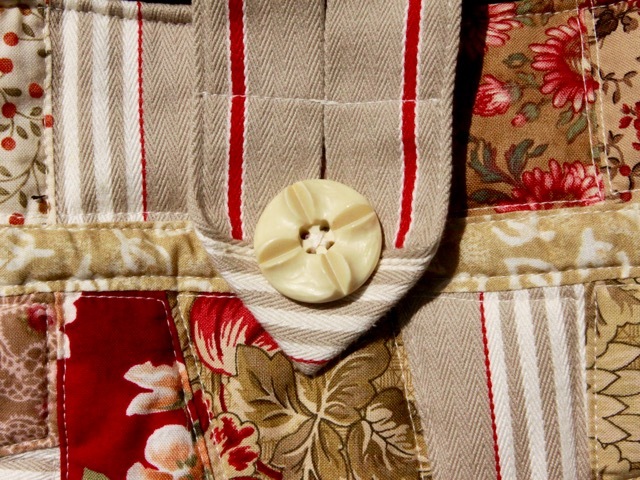 I love that each is unique and crafted with love of favorite fabrics. I have made several totes also, but need to remember to add inside pockets! *Lara B. sent me! I need a bag like that for my hexies. Maybe made out of hexies. I love this bag. And it could take on so many different looks depending on what fabric you choose. So fun! Nice bag, I like the colors. I can see why this bag was so popular, wonderful work and I like you fabrics on this one. Very nice. Love the fabric. Love this bag. I can see why everyone wanted one. Did you make up the pattern? I love a bag with pockets. The little needle case is a bonus. Very pretty bag -- I love the colors and the handles are great! Very nice bag Christine! I can see why it's sew popular. I love the idea of making crazy/scrappy bags. Will you share the pattern? So cute, and I love red and cream together.